Almost all of our fields have been recreated by agriculture, hay fields, shrubby pastures, wet meadows, and poor, dry meadows are considered on the respective pages of our on-farm habitats section. Below, we recap some of our early work giving an overview of fields - their history and their botany. In our blog, we've also dipped into the sounds of field insects, the fireflies we see 'or our meadows, field weeds, and the general ecology of old fields. 1) We can look and see. Much of our work is just such observations. 2) We can try to understand what is already known about the individual ecologies of the different species and try to guess which species may be most compatible with which habitats. 3) We can look at historical information. Because of the tremendous waxing and waning of agriculture in our region, we are presented with an experiment of a sort. Those species most closely tied to agriculture would be predicted to wax and wane in sync with agricultural activity. In order to provide background for the last approach, we describe aspects of regional land use history. Such information also emphasizes both the fragility and resilience of our landscape: we can and have stripped it of much of its forests, and forest can and has returned. Our hand is powerful and its touch must be tempered. Yet, at the same time, Nature is not a crystal queen; she does not shatter at first touch and might be hoped to reward temperance. For more detail on the history of our fields and for references pertaining to this account, see this book chapter. So, what do we mean by ‘fields’ and whence did they come? We define fields as being open areas dominated by grasses, sedges, or herbs. Pastures, hay meadows, and croplands including corn fields are, for example, all considered “fields”. Fields are a precursor to another important farmscape habitat – shrubland. At what point an old field goes from being field to being shrubland is somewhat ambiguous. Generally, if an area is a grassy stretch with scattered woody plants, we consider it an over-grown field. If there are mainly woody plants, with perhaps occasional interspersed herbaceous patches, then we consider it shrubland. Because shrubland usually follows from field, we mainly discuss fields here. We are, by inference, also discussing the origins of subsequent shrublands. 1) beaver damming - beaver meadows were formed when the ponds behind beaver dams eventually filled in with debris and plant life. These meadows eventually became forested and so the perpetuation of such grasslands in the landscape required constant beaver activity. Even before European agriculture took hold, extensive beaver trapping probably removed beaver as a major ecological force. They are returning. 2) dry soils and fire – sandy stretches such as those of the Albany Pine Barrens or at a few spots on Long Island could support grasses if fire knocked back woody vegetation. The control of fires probably reduced the extent of such grasslands after European arrival. Settlement pressure has also eaten up some of the largest natural grasslands in the Northeast. Thin soils on rocky outcrops sometimes create park-like, if not grassland, habitats. 3) fluctuating water level – fluctuating water level as might be caused by seasonal wet/dry cycles, can hamper woody vegetation growth, creating sedge meadows or marshes. 4) natural disaster – aside from fire, extensive tree fall caused by wind, snow and/or ice may also create temporary grassland patches depending upon extent and resultant destruction. 5) climate – tundra-like grasslands occur on some of our highest peaks, where thin soils, drying, and severe cold combine to limit woody vegetation; some suggest that vast grasslands existed for centuries along the southern margin of the receding glaciers. 6) Indian land management - Although the extent is debated, there is little doubt that the indigenous peoples created grasslands or savannah-like areas by their agricultural practices and possibly by intentional burns meant to improve wildlife habitat and/or clear understory. Like beaver meadows, such grasslands existed in the landscape only as long as their creators were at work. We have little particular information concerning Indian land use in Columbia County. The claim that “Claverack” is Dutch for “Clover Reach” and indicates that clover fields greeted the first explorers appears to be apocryphal. Nonetheless, the fertile lands along the Hudson were surely occupied and often farmed; the Goldkrest site in southwestern Rensselaer County, along the banks of the Hudson, appears to be the remnants of a Mohican fishing and farming village. The stone projectiles found around at least a couple of the farms we studied indicate the possible presence of hunting camps, but tell us little about earlier land use. In sum, it seems likely that in the few centuries prior to European settlement, our landscape was mostly wooded. For natural and anthropogenic reasons, there was probably a scattering of openings, although perhaps with little that would be a field to our eyes. Fire-maintained openings may have been most common in the northwest quarter of the County, where sandy soils seem to have created something approaching Pitch Pine barrens. These periodic and shifting patches may have been enough to provide native grassland and shrubland species with a foothold in our area, one from which they could expand as European agriculture began to clear the land more extensively. Figures 1 and 2. 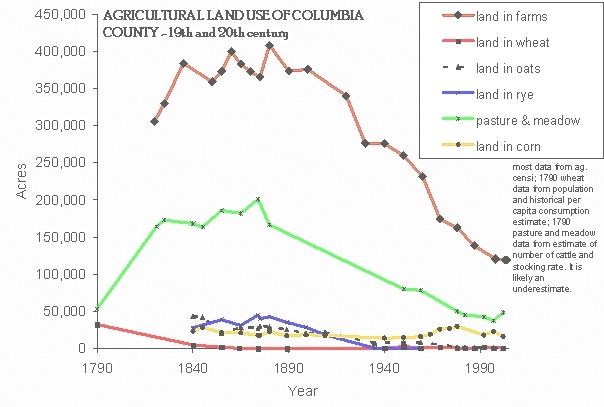 Statistical data on Columbia County agricultural production. The top graph shows agricultural activity in terms of acres under different uses. In some cases, acreage has been derived from production combined with historical estimates of production per acre. The bottom graph shows livestock numbers. European activity obliterated most, if not all, traces from previous indigenous cultures and is a major factor in determining the landscape that we see today. Because of that, we concentrate substantial effort on understanding the ecological effects of that activity. The land around us is not wilderness, and its dynamics cannot be understood by simply studying its current ecology and supposing a steady-state. What we see today reflects a mosaic of effects – current land use, historical land use, and the natural ecological tendencies of the players. It is obvious that plants play a central role in agriculture. They are cultivated for human consumption or animal fodder, seeded for ground cover, and/or planted as wind breaks, living fences, or shade trees. But aside from these cultivated plants, intentionally put in certain places by the farmer and carefully tended to ensure their establishment and growth, wild plants also make their home on farms. Some of them contribute directly to agricultural production as components of pastures or hayfields. Some may provide more subtle benefits to agriculture as food plants for beneficial insects, such as pollinators and pest predators. Notorious are the “weeds”, which by their presence, interfere with the growth of cultivated or agriculturally more productive species. However, the presence of the right amount of the right kind of weeds has also been suggested to benefit agricultural production. Many native wild plants maintain or find a foothold in the “neglected”, i.e., less intensively managed, areas of farms: along cow lanes; in hedgerows and field margins; in riparian areas; on the shores of ponds; in wet meadows, shrubby swamps, and old fields. Finally, most farms maintain woodlots composed in large part of native vegetation. Our main questions about farmland plants are: What role (if any) do farms play in the conservation of native plant species? What are the beneficial and detrimental effects of native plants on agricultural production? And finally, what can be done to enhance the farms’ role in native plant conservation and to increase the beneficial, while reducing the detrimental, effects of native plants on agricultural production? Which species of plants grow wild on Columbia County farms and what proportion of the flora of Columbia County is represented on farms? What proportion of the wild plants on farms is native to the region? Which general habitats do farms provide to native plants? More specifically, which native plants benefit from or are dependent on agricultural activity? What are the specific habitats they thrive in and which agricultural management practices contribute to these specific habitats? What are the interactions and trade-offs between native plant diversity and agricultural productivity? Are there any invasive species on the Columbia County farms that might merit attention? Most of this section is based upon early work we did at Hawthorne Valley Farm and six other farms in the County; we reproduce it here because it includes a level of detail which we have for few other farms. This appendix to our 2006 report on biodiversity on farms lists all the wild plants we documented during our early work on Columbia County farms. At least 536 plant species grow wild on farms (including their woodlots) in Columbia County. This means that the seven studied farms provide habitat for more than a third of the 1518 species known to occur in Columbia County. Even more impressive, Hawthorne Valley Farm alone harbors at least 486 wild plant species, or 32% of the flora of our county. Native plants on farms. At least 350 species (65%) of the plants documented on the farms are considered native to our region. Native plants occur throughout the range of general habitats found on farms. However, some of these habitats have a higher diversity of native plants than others. Also, plants of conservation interest tend to occur preferably in certain habitats. 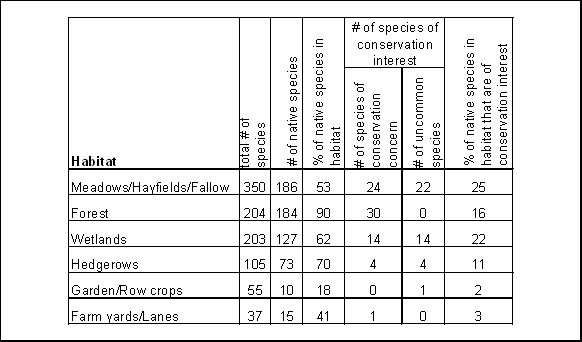 Table 1 provides a summary of the number of plants found in each general habitat type. Table 1. Distribution of plants in general habitats on farms in Columbia County. Although by far the largest number of plant species was found in meadows, the number of native species was almost equally high in meadows and forests. The other two habitats with considerable numbers of native plants were wetlands and hedgerows. The proportion of native plants was highest in the forest, somewhat less in the hedgerows and wetlands, and, finally, just above 50% in the meadows. The number of native species of conservation concern is highest in the forest and meadows, but still significant in the wetlands. In all three habitats, more than 10% of the native plant species are of conservation concern. Native plants that depend on agriculture. The above comparison of the plant diversity in general farm habitats strongly suggests a negative correlation between the suitability of a habitat for most native plants and the intensity of agricultural management in that particular habitat. A third of all the native plant species documented on farms occurred exclusively in forest. These species are expected to thrive in appropriate forest habitat, independent of whether or not the forest happens to belong to or abut a farm. An additional 15% of the native species were found in forest and well drained or wet meadows, and sometimes also in additional habitat types. Although three species of conservation concern (False Mermaid Weed, Halbert-leaved Tearthumb, and Sensitive Fern) are included in this category and occurred in wet meadows at Hawthorne Valley Farm, we have no reason to believe that agricultural activity is crucial for the survival of any of these plants in our region as long as appropriate forest habitat is available. In the following section, we will have a closer look at the distribution patterns of the approximately 50% of the native species that we found on farms and which we do suspect benefit to some degree from agricultural activity. For that purpose, we grouped the species by similar habitat requirements, and we will discuss the importance of each specific habitat for the conservation of native plants. Hedgerow plants.The details of woody plant distributions in hedgerows are described and discussed in our hedgerow page. In summary, only very few of the native plants documented in hedgerows were found exclusively in this habitat. Examples are Carrion Flower, Greenbriar, and Smooth Sumach. Columbia County seems to be at the edge of the range of the latter two species. 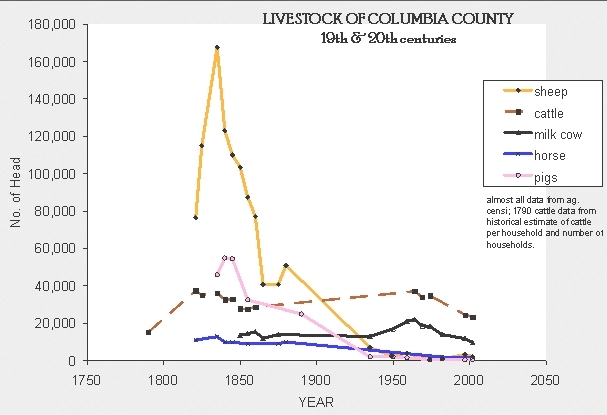 We don’t have a good idea why Carrion Flower was so uncommon on Columbia County farms. The regionally scarce Giant Ragweed, which was found on only two farms, occurred in riparian areas resembling hedgerows. Many of the other plants in hedgerows were forest plants that found a suitable home also in the hedgerows, including the uncommon and New York State vulnerable Winterberry and Flowering Dogwood. Were contiguous forest tracts to become rare in Columbia County, hedgerows on farms might become important for plant conservation by providing refuge to forest species. However, such forest decline seems unlikely at present. Around the intensively grazed meadows and cultivated fields, it is mostly along the hedgerows and fencerows that the widespread late-flowering native plants (most notably the asters and goldenrods) are able to flower and go to seed in any number. Depending on the surrounding agricultural matrix, hedgerows might be locally important for plant conservation as seed sources for meadow species that are not able to reproduce adequately in the surrounding, intensively-grazed meadows or cultivated fields. Longleaf Ground-cherry, found in pastures and hedgerows at Chaseholm Farm. Plants of open wetlands and wet meadows (for more detail on wet meadows, see this page). Approximately 23% of the native plants found on farms belong to this category, which makes it the largest ecological group after forest plants. More than 50% of the species in this group also occur(red) in Midwestern tallgrass prairies, of which only small remnants remain today. Before agricultural colonization of the Northeast, these species were probably mostly growing in beaver meadows, transitional swamps, and riparian areas. Agricultural activity at least temporarily increased the area suitable for these species by creating additional wet meadows and artificial ponds, as well as expanding and maintaining open riparian areas. However, many of these species have probably declined again due to the drainage of wet meadows for intensified agricultural management or, more recently, for housing or commercial development. Many of the remaining wet meadows were taken out of grazing and subsequently grew back to forest. Therefore, the species in this group (the approximately 80 species marked in Appendix 2 as occurring only in wetlands or in wetlands and meadows) are expected to benefit from the continuation of certain agricultural activities, e.g., the continued grazing of remaining wet meadows, provided no additional drainage of wetlands occurs. Green-headed Coneflower, considered regionally scarce by Hudsonia, grows scattered along the “Farm Creek” at Hawthorne Valley Farm. In the same wetland, we found Thin-leaved Coneflower, considered of uncertain status by Hudsonia, which forms a conspicuous patch along the lower Farm Creek. This species was also found on one of the other farms. Squarrose Sedge, considered regionally scarce by Hudsonia and recognized as a species of special concern in Connecticut, grows in the grazed wet meadows of the “North Hill” at Hawthorne Valley Farm. The same meadows might also harbour Retrorse Sedge, a species considered of uncertain status by Hudsonia. The identification of that species needs to be verified by a taxonomic specialist. In addition, we found the following wetland species to be uncommon on Columbia County farms and potentially declining compared to their historically reported abundance in the County: Allegheny Monkey-flower, Bulbiliferous Water-hemlock, Ditch Stonecrop, Dock-leaved Smartweed (not at HVF), Figwort (not at HVF), Golden Ragwort, Mannagrass, Marsh St.-Johns-wort, Narrow-leaved Speedwell, Sunflower, Swamp Candle, Water Parsnip, Water Smartweed (not at HVF), Wild Onion (not at HVF), and Yellow Avens. Plants of upland (often dry) meadows. Only 14% of the native plants found on farms occurred exclusively on upland meadows. However this group is two thirds composed of species that occur(red) in Midwestern tallgrass prairie and also includes a number of species of conservation concern. These species do not compete well with the introduced species that dominate pastures on good soils, but they find their habitat on dry, hill-side pastures. However, these habitats are dwindling as they are abandoned to natural succession. 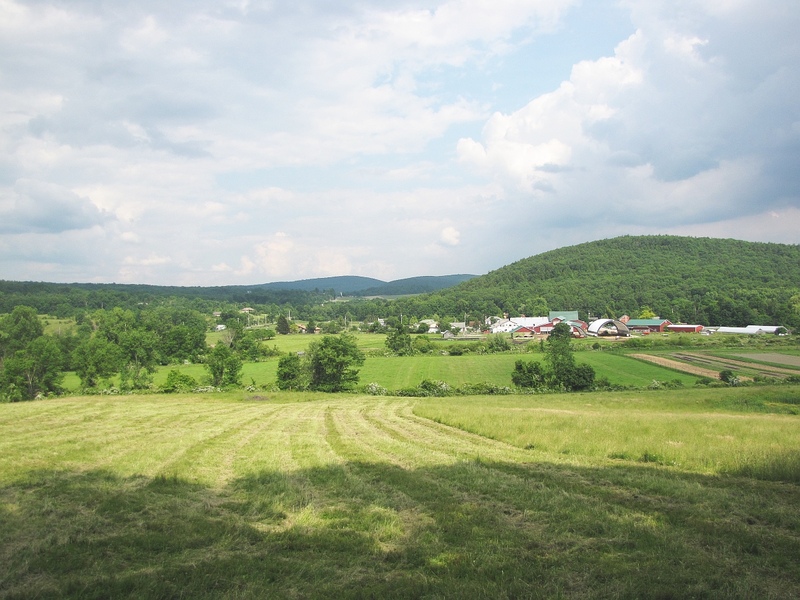 At Hawthorne Valley Farm, parts of “Steep Hill”, “West Hill”, “North Hill” and “Indian Valley” represent this kind of pasture. A couple of species in this group occurred in a different agricultural environment: on fallow corn fields that had been left to spontaneous succession. Soil conditions were clearly not yet good enough to support the more demanding introduced pasture species, and the uncommon native meadow plants found a (temporary) niche. Table 2 lists the upland meadow species of conservation concern and/or uncommonly found on Columbia County farms. Most of these native grassland species used to have a large habitat in the Midwestern tallgrass prairies. Locally, they became more common with the opening of forest for agriculture and the formation of grasslands through grazing of the native vegetation. Eventually, as we will see in the section below, even grasslands that never were seeded with introduced grasses and legumes were colonized by a range of introduced pasture plants. The native plants often were able to maintain their foothold in dry soils, where the introduced species could not out-compete them. Thus, hill-side pastures with their thin layer of soil and multiple rocky outcrops remain a refuge for these species. These dry hill-side pastures appear to be a rare feature on farms in Columbia County. Because their agricultural productivity is low, they were the first areas to be abandoned and to grow back into forest when the peak of agricultural activity in the County was past. More recently, the remaining open hillsides have come under increasing pressure for housing development. Steep, occasionally mowed roadsides, such as portions of the Taconic Parkway, as well as the vegetation along railways and under power lines, provide habitat for some of these species (e.g., Little Bluestem), but given the huge loss of tallgrass prairies to large-scale agricultural monoculture, it would be nice to think that diversified farms in our region are able to provide some refuge for these prairie species. Table 2. Upland meadow species of conservation interest. Native weeds in gardens and rowcrops. To our knowledge, native plants rarely become really troublesome weeds in market gardens and cornfields in Columbia County (compared, at least, to the headaches caused by certain introduced weed species). Probably the worst native weed around is Common Ragweed. Common Evening Primrose, Common Milkweed, Fall Panicum, False Nut Sedge, fleabanes, Longleaf Ground-cherry, Wood Sorrel, and Pennsylvania Smartweed also have been found in vegetable gardens or cornfields. Native plant diversity and agricultural productivity of pastures. The agricultural productivity of 16 pastures at Hawthorne Valley Farm was compared by Laura Weiland in 2004. The agricultural productivity of a pasture was measured as the herd’s milk production on the day after the cows had grazed on the respective pasture. Data for the years 1999 through 2003 were studied. The standardized vegetation surveys yielded comparable information of native plant coverage. The milk production on each pasture was then compared to the average milk production for the herd during the particular year and season. The Figure 3 illustrates the relationship between milk production (1=much less than average; 2=less than average; 3=around average; 4=more than average; 5=much more than average) and the percentage of native vegetation cover in the pasture. 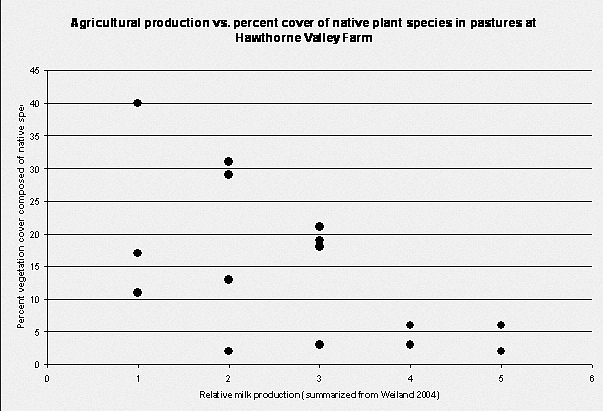 Figure 3.Relative milk production on Hawthorne Valley Farm pastures vs. percent of cover composed of native species. There is a clear tendency for the most productive pastures to have a small proportion of their vegetation cover composed of native species. Some pastures have a low milk production and a low proportion of native vegetation, but the pastures with the highest proportion of native vegetation consistently have a low milk production. Figure 4 shows the relationship between relative milk production and the total number of native species found in each pasture. Figure 4. 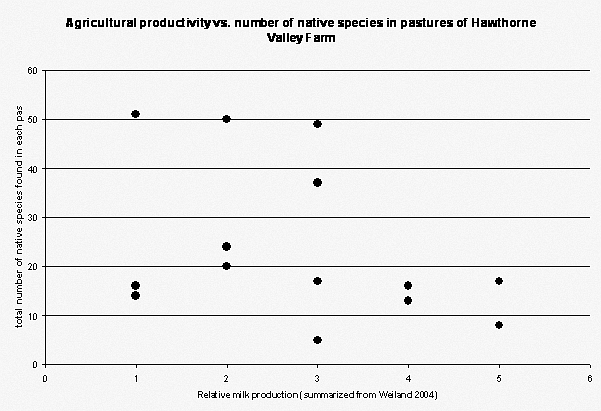 Relative milk production on Hawthorne Valley Farm pastures vs. total number of native species found in given pasture. Again, the most productive pastures consistently do not provide habitat for a high diversity of native species, while the pastures with the lower production may or may not have a high diversity of native species. Interesting is the fact that there are two pastures (West Hill and North Hill), where average agricultural production is compatible with a considerable number of native species. On Hawthorne Valley Farm pastures, milk production did not appear to increase with an increase in native species. While reasonable milk production seems possible in spite of the presence of many native species, native plant species may be out-competed by introduced plants on the best soils, and hence on the pastures supporting the highest milk production. Obviously, one can not expect farmers to let their most productive pastures degrade so as to provide more habitat for native plants. However, the knowledge that several native plant species depend for their survival on the continuation of grazing in marginally productive pastures might provide some justification for not letting those pastures grow into forest. Some have also suggested that at least occasional access to diverse pastures allows cattle to self-medicate. 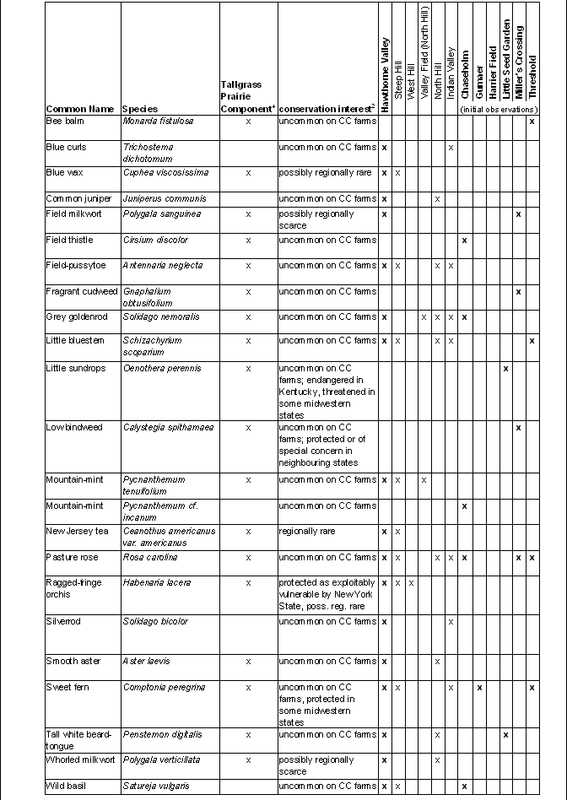 Of the invasive plants listed in the New England Invasive Plant Atlas, 33 were found on Columbia County farms (so marked in the early report appendix). Most of them occur on the meadows and include such common pasture weeds as Gill-over-the-round, Field Garlic, Oriental Bittersweet, Creeping Buttercup, Moneywort, Sheep Sorrel, Ragged Robin, and Reed Canary Grass. These seem to occur in tolerable densities on all studied farms and don’t seem to worry the farmers. An invasive species that might merit more concern and active management is Spotted Knapweed which was found on most farms and, at least at Hawthorne Valley, was particularly dense on dry hill-side meadows. This species produces a chemical that inhibits the growth of other plants in the immediate area and might well contribute to the degradation of these already marginally productive meadows. Its population dynamics and interaction with more desirable native species, such as Little Bluestem, might be an interesting subject for further study. A well-recognized nuisance on most farms is Multiflora Rose, which spreads quickly in hedgerows and into meadows. At Hawthorne Valley Farm, considerable effort is already going into keeping its population at bay, although around 2012, Rose Rosette Virus began to show itself. This virus has the potential to substantially control Multiflora Rose populations. Of the other invasive shrubs found in the hedgerows, Oriental Bittersweet and Autumn Eleagnus might merit monitoring. One gardener of Hawthorne Valley Farm named Canada Thistle as the most aggressive and hardest to manage garden weed. In the wetlands, Purple Loosestrife and Common Reed should be monitored and not allowed to spread extensively. Of big concern at Hawthorne Valley Farm are the approximately one dozen clumps of Japanese Knotweed that have established themselves along the shore of the Agawamuck. A concentrated effort over several years might be necessary to eradicate this highly successful invasive. If unchecked, it will certainly spread further along the creek and might eventually come to dominate its banks. In the forests of Hawthorne Valley Farm, one might consider the elimination of the Norway Maple trees and the Japanese Barberry bushes. Garlic Mustard grows densely in the alluvial forest along the Agawamuck and might, in the long-term, have a negative impact on the exceptionally rich spring flora of that forest. However, the resident biologist, Craig Holdrege, who has been observing that flora for more than a decade, has the impression that the Garlic Mustard population within the alluvial forest waxes and wanes and does not seem to spread deeper into the forest of Phudd Hill. He also did not recognize any alarming trends in the native, co-occurring spring flora. This Garlic Mustard population might be another fruitful subject for further study and experimentation. On three of the other farms, we noted individuals of the highly invasive Tree of Heaven. These might merit monitoring to avoid their unwanted spreading. Don’t remove established hedgerows. Don’t keep field margins too tidy. Avoid drainage of wet meadows and continue the management that has kept them open, e.g., light grazing. Should wet meadows directly abut a creek, it usually is justified to restrict the access of grazing animals to the creek to reduce siltation, even if that measure may result in a reduction of habitat for native plants of open wetlands. The same is true for the shore of watering ponds. Restricted access reduces wetland plant damage from trampling and benefits the amphibians at the same time. If the farm has old fields or marginally productive pastures that are slowly being overgrown by shrubs, consider rotational brush-hogging or browsing and continuation of light grazing to maintain their suitability as habitat for native tallgrass prairie species. Where considerable populations of native grasses already occur, consider management for these grasses as forage.